Billy Stockman Tjapaltjarri was one of the painters to paint the historic mural at Papunya primary school. This mural was the first spark of the Western desert art movement. In the early part of his career, Billy Stockman Tjapaltjarri painted on small bits of board. He went on to become one of the most vital figures of the aboriginal art movement. Many of his early works are ritual and contain secret imagery meant only for the eyes of initiated men. His later works are on Canvass and vary from masterpieces down to simplistic. 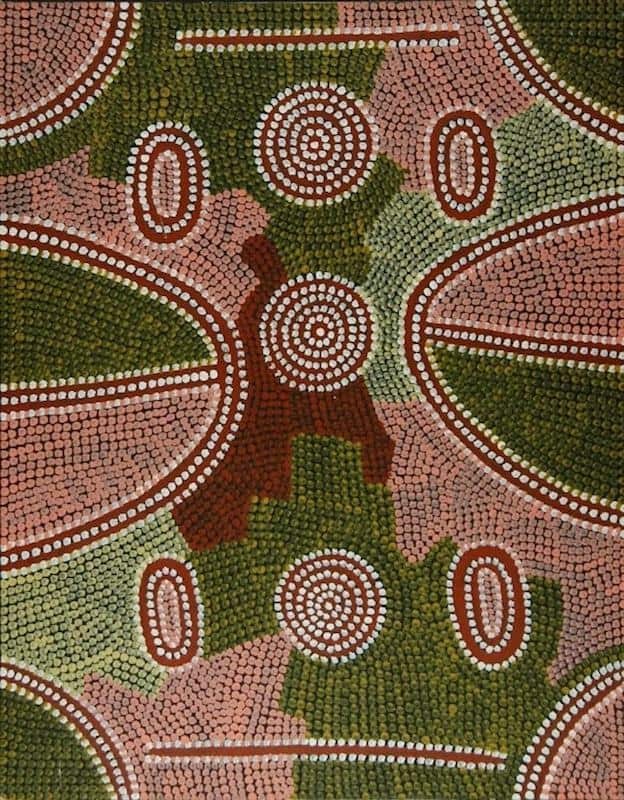 The aim of this article is to assist readers in identifying if their Aboriginal painting is by Billy Stockman Tjapaltjarri. It compares examples of his work. It also gives some background to the life of this fascinating artist. 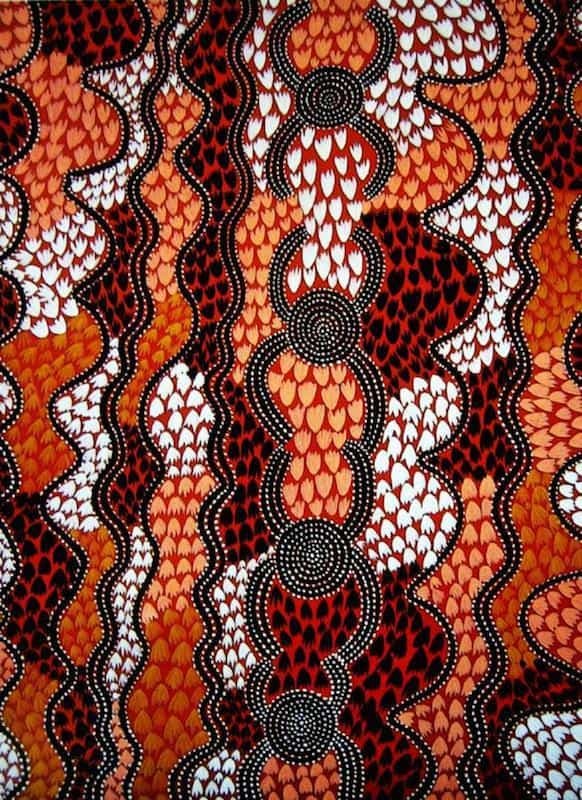 If you have a Billy Stockman Tjapaltjarri Aboriginal painting to sell please contact me. 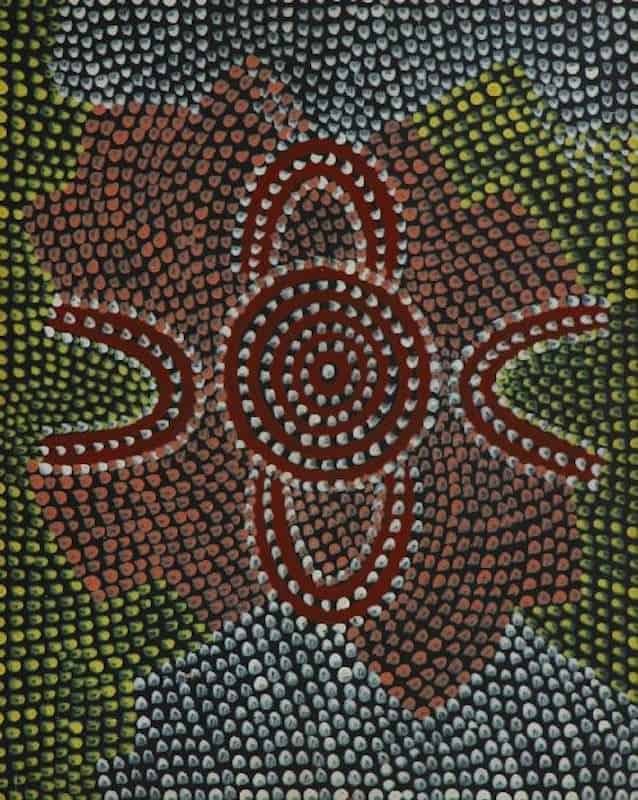 If you want to know what your Billy Stockman Tjapaltjarri painting is worth please feel free to send me a Jpeg. I would love to see it. 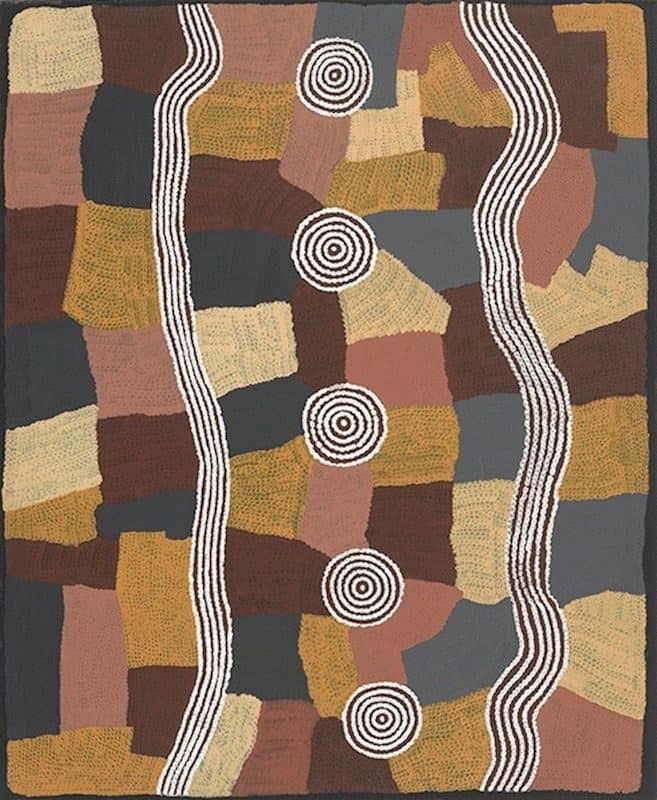 Born in 1926 Billy Stockman Tjapaltjarri was of the Anmatyerre-Western Arrente people. His clan lived around Ilpitirri, North-West of Papunya. Billy Stockman’s first experience of white people was the Coniston Massacre in 1928 at the age of two. His mother hid him under a bush on a coolamon. His father had gone hunting but his mother killed. Billy Stockman Tjapaltjarri grew up at Napperby Station 200 km west of Alice Springs. He was traditionally initiated and learned his customary stories. Later he worked as a stockman from where he got his nickname. On Napperby station he would have worked with other aboriginals including Tim Leara, Clifford Possum and Kaapa. He moved to the Papunya settlement as part of the government resettlement program. In Papunya made money repairing old cars and worked at the Papunya School with Uta Uta and Anatjari as a yard man. In 1971 Geoff Bardon became a local school teacher at Papunya primary. He tried to encourage local children to paint in their own traditional style. When he was told only older men could paint these stories he decided to enlist some local men to paint a mural on the school wall. 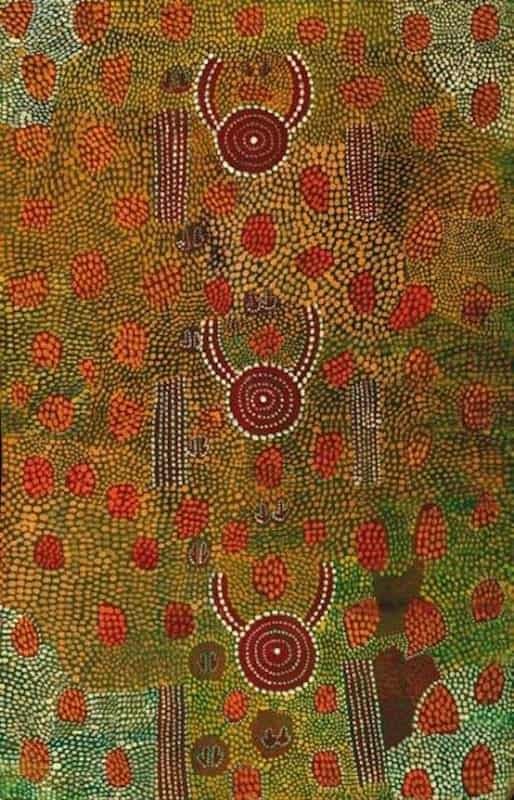 Billy Stockman Tjapaltjarri along with Long Jack Phillipus, assisted Kaapa Mbitjana in the painting of the Honey Ant Dreaming on the school walls in 1971. The honey ant dreaming was a design of great power and relevance to all of the tribes of the Western Desert. The Mural generated a lot of excitement and discussion throughout the settlement. Essentially spiritual, the symbols that appear in this mural were charged with authority and religious knowledge. Billy Stockman with supplies from Bardon soon became a regular painter. With Bardons encouragement, numerous aboriginal men from different clans would gather and paint while singing songlines. These paintings related to the land myth and legends of the western desert. Billy along with Yala Yala, Shorty and Leura received grants from the Australian government that allowed them to paint full time. When paintings began to sell in Alice Springs other aboriginal groups complained about the imagery. The imagery was seen as infringing tribal laws. Billy Stockman, in particular, understood the necessity of choosing less controversial subjects such as food gathering and children’s stories. Billy Stockman Tjapaltjarri quickly took to dotting backgrounds and dotting over images that gave away to many secrets / sacred knowledge. 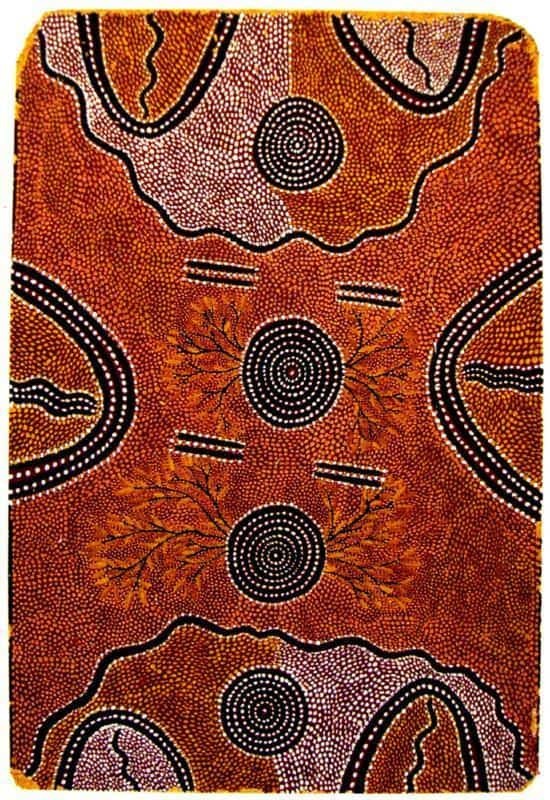 This overdotting was to later typify Aboriginal western desert art. Billy had a large extended family and was a powerful and influential man with many obligations to many. It was this position that placed him so centrally in the painting group that was to become the aboriginal art movement. His early artworks are often intense and precise. Billy Stockman’s work was among the first to stir the purchasing public’s interest. He made a point of thanking Bardon personally and began to apply himself with great enthusiasm to painting. All of the men were greatly encouraged by the money received from the sale of their paintings. It was a way of improving the lives of their families but also re-kindled a sense of self and community esteem among the men who had, to a degree, been estranged from their once important tribal positions. Senior men like Billy Stockman were instrumental in advising on symbols, stories, and meanings during the creative process. Billy Stockman Tjapaltjarri had a way of focusing on simple, self-contained vignettes. They often contained stylised, naturalistic plants and animals and asymmetry and decorative quality that appealed to buyers. As the art movement gathered momentum, his life as a stockman had also prepared him for negotiating with the world of the ‘whitefella’. Billy Stockman held many official positions. He played a critical role in the newly established Aboriginal Arts Board during the 1970’s. He had a stint as chairman of highly influential Papunya Tula Artists. Politically he became a major campaigner for the outstation movement. He was one of the first to move to his own station at Illili, West of Papunya. Here, he continued painting his Dreamings and instructed younger artists on the ancient knowledge he was a custodian of many important traditional stories including Budgerigar, Water, Snake and Wild Potatoe Dreamings of his own country. He and his wife Intinika had two sons and two daughters. One of his daughters Gillian also became a well-respected painter. He also painted so really fast and lower quality art to sell to make money. These pieces lack the spirituality of his earlier works and have little value.